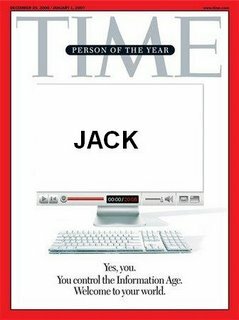 I'm Time Magazines 2006 "Person of the Year"!!! I've just learned that I'm sharing the title of Time Magazine's 2006 "Person of the Year." And I thought all this blogging stuff was a waste of time. Somebody ought to buy me a drink! You scored as Special Ops. Special ops. You're sneaky, tactful, and a loner. You prefer to do your jobs alone, working where you don't come into contact with people. But everyonce in a while you hit it big and are noticed and given fame. Your given the more sensitive problems. You get things done, and do what has to be done. Who: Hayes Carll & Friends. Friends like Todd Snider, Ray Wylie Hubbard, The John Evans Band, The Dedringers and Graham Wilkinson. 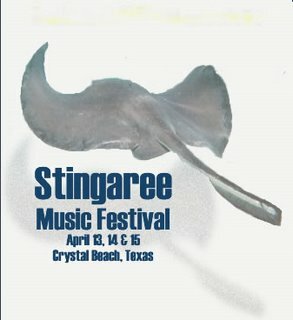 Hayes Carll is hosting a music festival on the Bolivar Peninsula. Hayes and friends will be performing in a variety of different venues throughout the weekend. There will be beach performances, impromptu beach house concerts and evening shows under the big top. When: April 13th, 14th & 15th, 2007. Why: Because it just doesn't get any better than this. I gotta rent me a beach house for the weekend. Tickets are $65 and can be purchased here. Go here and vote for the Ranting Sandmonkey. In other news, the BBC reports that, in an article published in the British Medical Journal, researchers have determined that long pointy knives have no legitimate culinary purpose and should be banned. 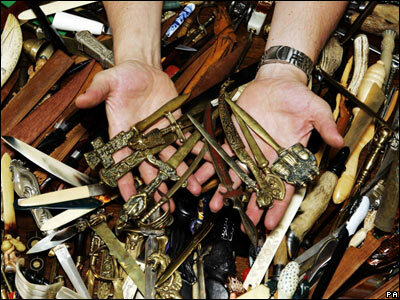 A CONSCIENTIOUS collector has handed more than 500 letter openers to police during the national knife amnesty. The Edinburgh man, who asked to remain anonymous, surrendered his collection, which he told officers had taken him more than 40 years to amass. He said he wanted police to take possession of the sharp-edged letter openers after he grew concerned they could fall into the wrong hands. THIS five-foot martial arts sword capable of beheading a man was recovered by shocked cops in a house raid. 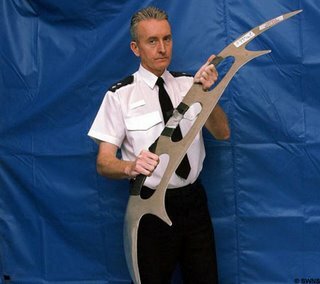 The terrifying Batleth weapon is identical to one wielded by Klingon aliens in the Star Trek sci-fi films. Officers seized the three-handled sword — which has huge pointed blades at either end — at a home in Gloucester. Jiminy Christmas! I'm ascared just looking at that thing! Obviously designed with one purpose in mind--to kill people! Why else would anyone own such a thing? I can see why that wussy twig boy might be afraid of some Trekkie with a bat'leth hanging on his wall, but the idea of grown up people getting worked up about other people owning knives or swords or guns is something I'll never understand. "knife amnesties fail to reduce crime, despite taking thousands of weapons off the streets, according to a police report." So let's sum it up: It's stupid. It's useless. It infringes individual liberty. But so what if it doesn't work; somebody's got to do something! And doing stupid, useless things that infringe individual liberty is what governments do best! I think it all comes down to this: Our British friends have degenerated into such a state of impotent wussiness that they have become a parody of themselves. Once upon a time, there were a few men in England who were man enough to pull a knife on the King at Runnymede when necessary to secure his agreement to respect their rights. Now that they've given up their knives, there's not much chance anything like that will happen again any time soon. As Ben Franklin is said to have said, "Those who would give up essential liberty to purchase a little temporary safety deserve neither liberty nor safety." I expect they'll be getting everything they deserve. A St. Louis man was shot to death Sunday night over a warm beer, police said. St. Louis police say a woman shot her husband, who was about 70 years old, four to five times in the chest after he tried giving her a warm can of Stag beer. All things considered, it's a wonder the British Isles weren't depopulated centuries ago.